Haven't done one of these in awhile—not that there hasn't been ample opportunity provided at every newsstand in America. 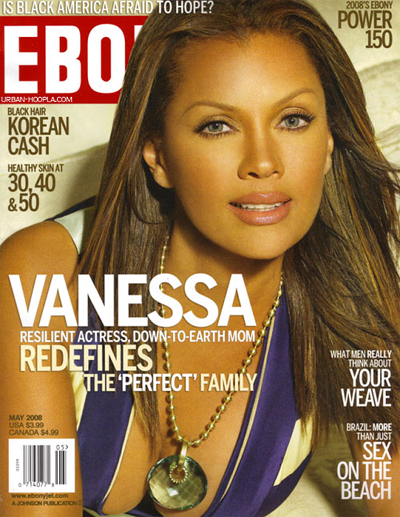 Anyway, here's the always-stunning, talented, and witty 45-year-old Vanessa Williams on the cover of May's Ebony, with approximately 15 years, every ounce of character, and most of her humanity airbrushed out of her face. Horror of horrors!—It appears that at age 45, Ms. Williams has actually had the audacity to acquire some wrinkles! My god, will someone stop this woman?! 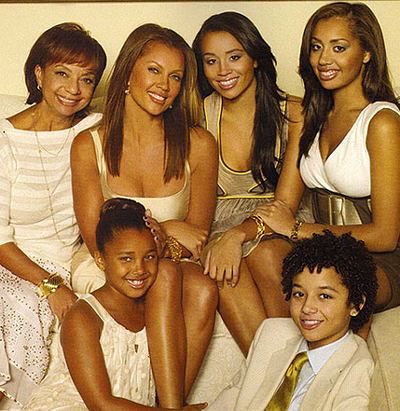 …who are referenced on the cover as her "perfect" family and have undoubtedly given her unquantifiable amounts of joy over the years. Yet the very laugh lines caused by that precious and authentic happiness are stolen from her in the pursuit of a counterfeit beauty.